Stop and see what happens: Red Light, Green Lion – Joyce's mystery and fiction book reviews with some non-fiction too! 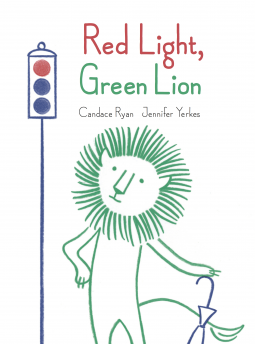 Red Light, Green Lion is one of those children’s books that also has a fine and uplifting message for adults. It is about the unexpected things that can happen in life and about coping with whatever comes up with an open mind and heart. Some examples of the clever pages in this book…each is on a two page spread with whimsical line drawings, so at first it is not clear what the second page will say. “Then on some days, when we feel most discouraged, something amazing happens right in front of us, and we don’t even notice it happening. This is a sweet book with a positive message. Thanks to NetGalley and the publisher for this e-proof. The opinions are my own.